Dhaka, Feb 25 (Just News): Rights body Ain O Salish Kendra (ASK) has expressed deep concern over yesterday’s police action to foil the “black flag” procession of the BNP demanding immediate release of their party Chairperson Begum Khaleda Zia. ASK also strongly condemned the reported arrest of some 50 leaders and activists of the political opposition, said a press release. Quoting media sources, ASK said around 100 BNP activists were hurt in police action. 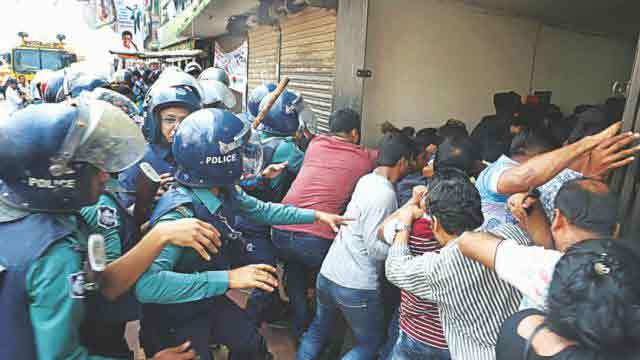 It also blasted the law enforcers’approach to disperse the BNP activists who thronged in front of the party office at Nayapaltan in Dhaka yesterday. Police yesterday charged baton, sprayed hot water on the agitating BNP activists, who have been demanding the release of Khaleda Zia. BNP Chairperson Khaleda Zia landed in jail on February 8 after she was convicted in Zia Orphanage trust case. ASK has observed that holding meeting, protest rally, procession are democratic rights of a political party. The rights body maintained that the actions of law enforcers are unexpected.